Heading south from Naples, Florida along the southwest coast, one of the last populated areas (1,000 residents in 2011) is Everglades City. 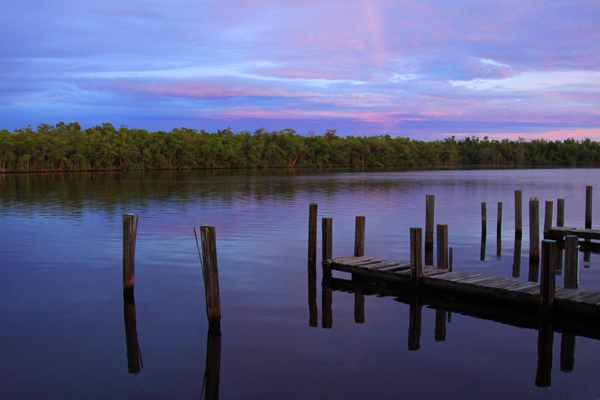 Known for stone crabs and environmental touring of the area, it is the northwest entry into Everglades National Park. On this particular summer evening I interrupted a casual waterfront dinner to capture this rare combination of rainbow and sunset. 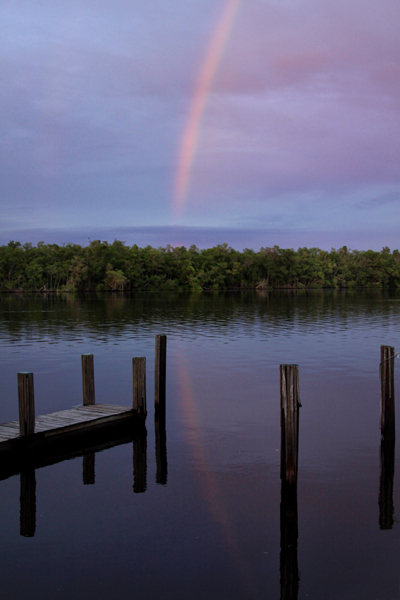 Rainbows come and go within a matter of minutes and are best captured as soon as they are seen (and preferably with a polarizing filter to bring out the colors). Additionally, the fleeting magic hour (actually sometimes just minutes) following sunset, often provides spectacular lighting for creating beautiful land and seascapes, but is also soon just a (hopefully recorded) memory.